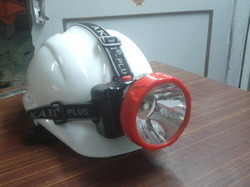 We have the expertise in trading, exporting and supplying a very modern and sophisticated Head Lamp which is used in various industries such as mines. These are manufactured using premium quality raw material and advanced technology in conformity with the set industry standards at our vendors' end. Apart from this, our offered lamps are highly appreciated by our clients for their excellent functionality and other salient features. Incepted in 2010, in Mumbai, (Maharashtra, India) we “Rudhhra Enterprise”, are engaged in trading, exporting and supplying highly reliable assortment of Hand Protection, Eye Protection, Foot Protection, Head Protection, Body Protection, Fire Protection, Fall Protection, Face Protection - Disposable, Safety Jackets, Road Safety, etc. The offered products are widely used in various industries for safety purpose. Our products are procured from some of the licensed and trustworthy vendors of the market. These products are manufactured and designed as per the international quality standards using high grade raw material with the aid of innovative technology at the vendor's end. These products are highly acknowledged for their durability, easy to maintenance, reliability, sturdy design, easy usage, wear & tear resistance and light weight. Moreover, our clients can avail these products in various sizes and designs as per their requirements.